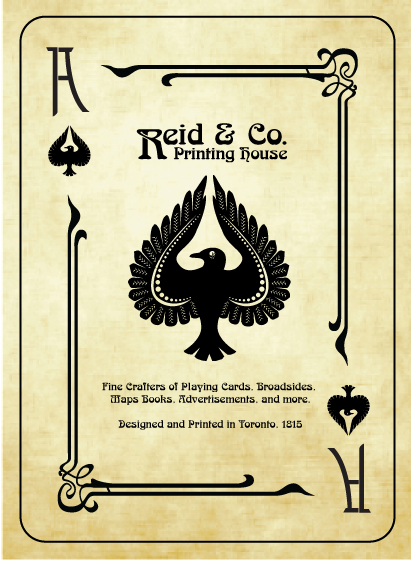 I also decided on a back-of-card design, which I've done a quick mock up of as well. While the ripple pattern halftone was an interesting start, I wanted to go a different direction with it. What I've attempted should look clearer and creepier the further away you get, but I'll have to make sure it's just the right amount of distinct and subtle, probably with a few test prints. Enough talk, here's the cards! 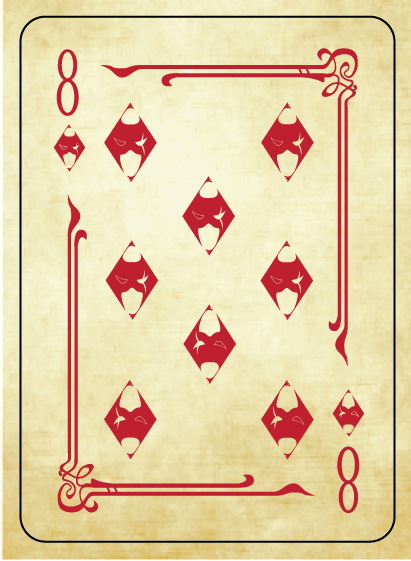 Weak damage, as exemplified by this ace card, will have but a single subtle slash in the top-right corner. 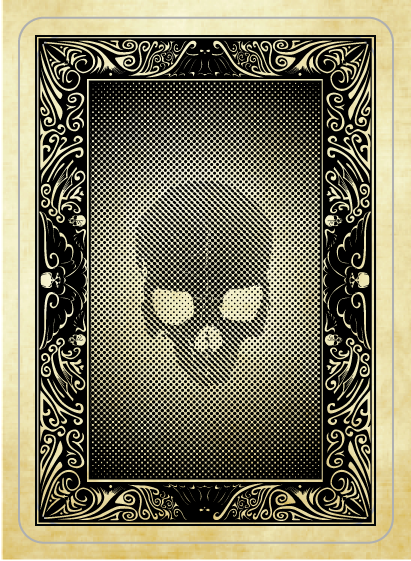 I've also compiled the look of the ace of spades, and added a test-sample version of the parchment feel I will be using for the cards eventually. Sure by this time they were capable of crafting pure white paper, but where's the fun in that? Moderate damage, here modelled by this fabulous eight of masks, is denoted by two pips. I was tempted to go fancier, like the arabesques, but I realized I'd rather keep them easily distinguishable, and not at all something that could be confused for the rest of the design. Originally, I was going to feature a look like this as Weak, with two lines denoting a kind of box, but I realized as soon as I put in the Moderate damage (with three lines) that it just ended up looking more confusing. Finally, the back of the cards. Doing it in sepia like this has made me realize I will have to strengthen the lines on the N and S skulls, as well as the wing details and width of some other details across the board. On to the important bit though! Rather than the ripple pattern of the last iteration, here I've used one of the free vector skulls already on the pattern to make a subtle skull in the midst of an otherwise relatively plain field. I may have to tone back the skull still further to make it more subtle; what I want is the pattern to be more apparent the further away you are. Up really close, an interference dot pattern. Further away, a very creepy skull gradually resolves. This way anyone walking past the table, or seeing the deck from a distance will be suitably creeped out by the sight of it. Thoughts on this are especially welcome. I'm not entirely settled yet on some of these designs, so input is welcome always. Enjoy! 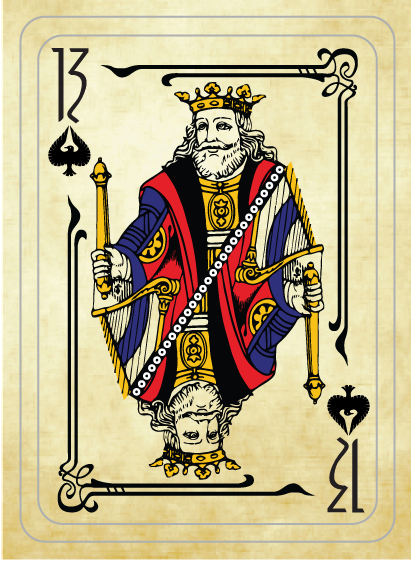 Also, I think I have, through editing, ended up with a deck that has no copywright-related images, objects, etc. in it, so I may even be able to print these for others! I was careful to only take vectors from free offer sites, and everything else is original work. I'll try to find a way to make these available once I get the first run done. I am also hoping to do a unique card case for them. The website sends them out in plastic cases, but we all know they should be in paper sleeves. Once I work out a nice simple design for those, I'll post them as well.